The Sounders on Tuesday lost out on Peruvian midfield target Paolo Hurtado when he signed with a Turkish club. The team is expected to announce the signing of Australian left back Brad Smith on Wednesday and possibly add an international attacking player before the summer transfer window closes Wednesday night. To say the Sounders got away with one in recent days while letting another one get away is putting it mildly. The sheer joy of the team winning at Minnesota last Saturday with what was their latest-ever comeback victory was tempered Tuesday by news they had lost potential signee Paolo Hurtado to a club from Turkey. Peruvian midfielder Hurtado had flown in to Seattle late last week to speed along negotiations with the Sounders, who ultimately could not meet the transfer fee his Portuguese side received from Konyaspor in the Turkish first division. Sounders general manager Garth Lagerwey was not immediately available for comment. The Sounders will try to alleviate the sting of that setback by announcing – perhaps as early as Wednesday morning – the addition of Australian left back Brad Smith, 24, who has garnered English Premier League experience with both Liverpool and Bournemouth. Smith would be on a one-season loan from Bournemouth and eligible for recall in January. Also, the money not spent on Hurtado is expected to go to at least one additional midfielder before the expiration of the summer transfer deadline at 9:59 p.m. PDT Wednesday. And right now, the Sounders will take all the reinforcements they can get, despite a 5-0-2 record their last seven Major League Soccer matches. They badly outplayed Minnesota United FC for most of Saturday’s contest, but needed a tying goal by Nicolas Lodeiro in the 91stminute and another from Will Bruin in the 97thminute to escape with three points. Indeed, it was the latest the team has overcome a 1-0 deficit to win a match in stoppage time across all competitions. It was also the latest they have scored in stoppage time to win any match. The previous team record came in a 2-1 victory over CD Olimpia of Honduras during CONCACAF Champions League play in August 2015. Olimpia led 1-0 until Erik Friberg equalized in the 90thminute and then Brad Evans scored on a penalty kick in what was officially the 97thminute, but only after some pre-kick shenanigans by the Hondurans to delay the game by several minutes. On Saturday, the match was eight seconds from entering the 98thminute when Bruin took a Raul Ruidiaz flick and lobbed the ball over the goalkeeper for the winning strike. The Sounders are looking at several additional midfielder candidates, including Nicolas Delgadillo from C.A. Velez Sarsfield in Argentina — with multiple reports Tuesday both confirming and denying he was in-play to transfer on a loan. The Sounders are in a bit of a salary-cap crunch, which is apparently why the Hurtado deal fell through at the last minute. At present, the team has three designated players: Clint Dempsey, Lodeiro and newcomer Ruidiaz. That meant any salary for Hurtado would have been pro-rated and capped at the maximum $1.5 million targeted allocation money (TAM) limit for this season until Dempsey’s deal could be jettisoned this coming winter. For now, the addition of Smith will create immediate competition for playing time for incumbent Cameroonian left back Nouhou. The Sounders have huge hopes for the 20-year-old Nouhou, whose play has been much stronger during the team’s unbeaten streak. But Nouhou is only in his second season and there is a feeling among Sounders coaches and front-office members he could use a push from a high-level player, such as the one he got from Joevin Jones last season. The Sounders didn’t use Nouhou as a regular starter until midsummer and got him on the field more as a left back down the stretch when Jones pushed up to left wing. Smith can play the wing as well. With Victor Rodriguez still iffy with a hamstring issue, the team has relied more heavily on midfielder Harry Shipp on the left side and it’s possible a Nouhou-Smith combination of sorts could be in the cards the way the Cameroonian was paired with Jones during last year’s playoff run. But the bottom line is, with Smith only a loan, this appears more a move to push Nouhou – even to the bench at times – than to permanently replace him. The sooner the Sounders can get all the newcomers on board, the better, though it won’t happen in time for Sunday’s match against conference leading FC Dallas – which beat the Sounders 3-0 in March. 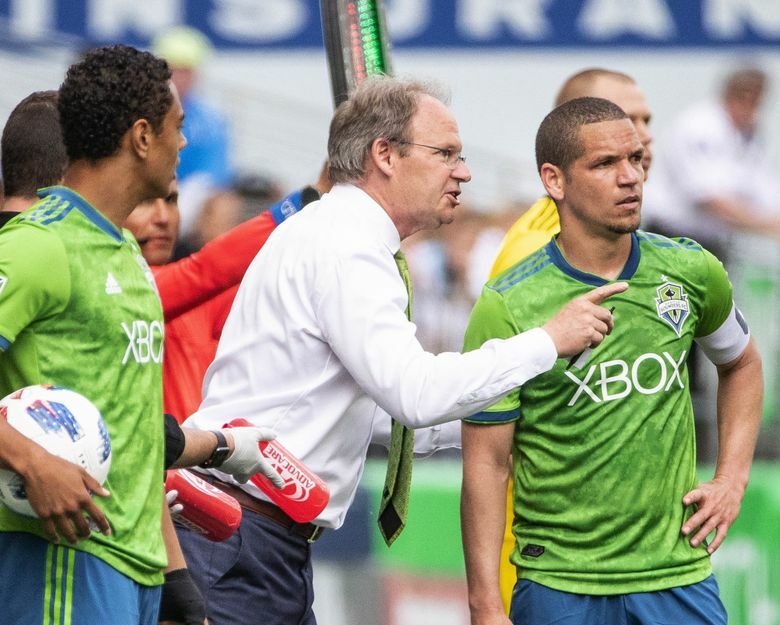 But the near-defeat and prospect of almost falling eight points out of the playoffs shows just how precarious a position the Sounders’ poor start to the season had left them in. Things won’t get any easier as Dallas visits CenturyLink Field in a possible playoff preview – if the Sounders can make the postseason.